Spend a fun week doing the red theme with your kids. Red is the color we usually start with. It is a great idea to send your kids around the room, or house to find objects that are red as a way to begin the week. It is also fun to wear red, and eat red foods! Go on a red scavenger hunt, have your kids make a list either writing or drawing the red items they find. Wear red clothing each day. Have your kids come up with items, foods, flowers, etc that are red. Try to find pictures of these items and make a red collage. Have a red meal or snack, some ideas are: red delicious apples, strawberries, raspberries, marinara sauce, cherry pie, or watermelon. Gather red craft items (glitter, tissue paper, paint, ribbon, beads, etc.) and decorate a frame made of popsicle sticks, put a red picture made by your kids in the frame. Do a watercolor painting activity only using different shades of red. Learn about animals and insects that are red. Have your kids do a handprint in red paint, and save it. Do a handprint for each of the color weeks, when you are done you can make it into a book about colors for your little ones. 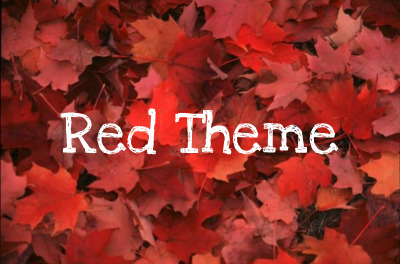 Did you like the red theme week? Try more themes here.